The lamb mixture gets better with time, so you cam make it the day before. Once baked and cooled, the meatballs also freeze well. 1. Preheat the oven to 200˚C, gas mark 6. Start by making the meatballs. Put the onion, celery, garlic and olive oil in a pan with 100ml water and a pinch of salt. Cook over a high heat until the vegetables are sizzling and dry (about 7-10 minutes). Drain on kitchen paper, then tip into a large mixing bowl and leave to cool. 2. Add the lamb and remaining ingredients to the vegetables, mix well, then divide into 50g portions and roll into balls (about golf-ball sized). Place on a parchment-lined baking tray and bake for 30 minutes, until browned and cooked through (or chill until needed, then bring to room temperature before baking). 3. Meanwhile, put the sweet potatoes and potatoes in a pan, cover with cold water, bring to the boil and simmer for 15 minutes, until tender; drain well. Mash, beat in the allspice and butter; season. 4. Heat a griddle pan over a high heat. Cook the courgettes in batches for 2-3 minutes on each side, until slightly softened. Place on a plate, season with salt and drizzle with the olive oil. These can be chilled until ready to serve. 5. 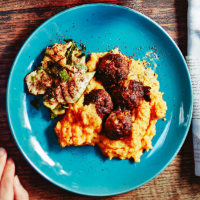 Put the meatballs, mash and courgettes on plates, scatter with sumac and serve.